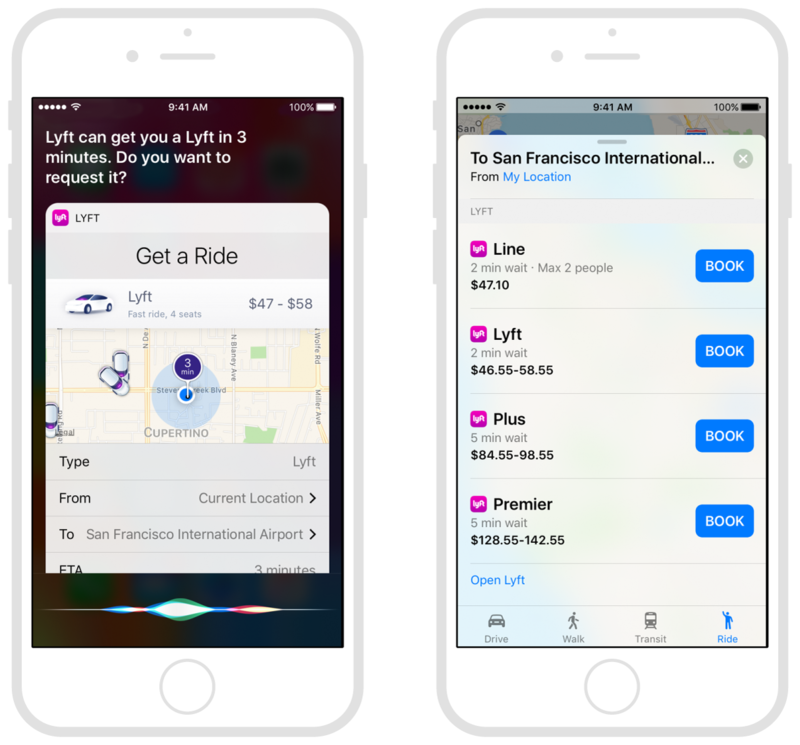 Users can book rides from either Siri or Maps. When the user requests a ride from your service, SiriKit forwards the information to your Intents app extension for processing. The user can ask you to provide a list of available rides, to initiate the booking of a ride, and to provide status updates for a booked ride. Maps expects you to handle all of the intents in this domain and will not load your Intents extension if you do not support all of them. You can provide a custom interface for ride-booking intents using an Intents UI app extension. Understand how Siri and Maps generate ride-booking intents and learn tips about how to handle those intents. An interface for adopting all of the protocols in the ride-booking domain. Maps uses this intent to obtain a list of ride options from your ride-booking service. Siri does not generate this intent. Generate ride options for Maps to display to the user. The handler interface for fetching the list of rides currently available from your ride-booking service. An intent for getting the types of rides available from a ride-booking service. Your app’s response to a list ride options intent. Book the ride based on the information provided by the user. The handler interface for booking a ride for the user. A request to book the specified ride from your service. Your app’s response to a request ride intent. Return the status of the booked ride that is currently active. The handler interface for fetching the status of the user’s current ride. A request for the current status of a previously booked ride. Your app’s response to a get ride status intent. An interface for providing updated status for an active ride. The handler interface for canceling a previously booked ride. An intent requesting the cancellation of a previously booked ride. Your app's response to a cancel ride intent. The handler interface for sending ride feedback to your service. An intent indicating that the user provided feedback for a completed ride. Your app's response to a send ride feedback intent. When crafting your responses, use these objects to specify details about the booking, the vehicle, and the driver providing the ride. Details about a type of ride offered by your ride-booking service. The status of a ride booked through a ride-booking service. Identifying information about a driver of a ride service. A specific vehicle used by a ride-booking service. A specific type of ride-related charge. The price of a ride involving the specified number of people. Additional details about whether a ride completed successfully or was canceled.